Citation: Abdelmoaty AM, Amin TT, Obaid HA, Abdelsadek OAA, Hassan UHB, et al. (2018) Complementary Medicines among Egyptian Oncology Patients at a Tertiary Level of Care: Pattern and Motives. Health Sci J. Vol. 12 No. 2: 561. Copyright: © 2018 Abdelmoaty AM, et al. This is an open-access article distributed under the terms of the creative commons attribution license, which permits unrestricted use, distribution and reproduction in any medium, provided the original author and source are credited. Background: Cancer patients seek all possible options of effective therapies. In Africa 80% of the population had used complementary medicine (CM) at least once during cancer treatment course. Some CM products might pose health risks .In Egypt, studies regarding the use and motives behind CM among cancer patients are scarce if any. Objectives: Assessing the pattern of use, motives and possible predictors of complementary cancer therapy among a sample of Egyptian oncology patients. Subjects and methods: A cross-sectional study conducted at Kasr Al Ainy University Hospital (Oncology Unit), Cairo, Egypt. Reviewing of the patients medical records as well as Personal interviews were conducted. Results: Of the included patients 76 out of 331 (about 23%) used CM during their cancer treatment course; none of them used any alternative cancer therapies. Being female patient with low educational attainment (secondary or less) were significantly associated with the use of CM (OR=1.78, P=0.018 and OR=2.90, P=0.011 respectively). The dominated reason for using CM therapy was to increase their body's ability to fight cancer (31.6%). Dissatisfaction with therapy was a significant positive predictor for CM usage (OR=2.10, P=0.006). Honey and herbal medicine were the most commonly used CM. More than 60% of the patients used CM (48/76) didn’t inform their treating physicians about CM usage and almost 23% of (11/48) responded that the physician would disapprove it. Conclusion: This study revealed that a significant proportion of Egyptian patients undergoing cancer therapy are using CM in response to their dissatisfaction with the conventional cancer therapy. Cancer is one of three leading causes of death in developing countries; associated with significant disabilities and is considered as a major public health problem. According to World Health Organization (WHO), it is expected that cancer rates will be doubled by 2030 . Cancer patients and their families face the trauma of distress, worries and immense fear, they seek all possible options of effective treatment. Some patients also search for the complementary medicine (CM) option. (CM) is a part of the traditional medicine, commonly used and reflects the sum of knowledge, skills and practices built on experiences, beliefs and theories of different cultures. This practice is widely used worldwide; 80% in the African population and 42% among the Americans had used it at least once . It was reported as well in many countries including the developing countries, Mediterranean region and Islamic societies; In Palestine, the use of at least one type of (CM) was 73%; In Lebanon, a survey documented the use of (CM) in about 30% of adults ; In Egypt it was found that 77.5% of adults reported the use of CM . Many patients with chronic illnesses including cancer use (CM) during and after treatment and the reasons included doubts concerning the effectiveness of conventional treatment, dissatisfaction with the medical care and attempts to improve one’s physical and emotional health . Complementary medicine practices are gaining further interest in Oncology specially when the patients are desperate and decide to leave the Western medicine path . Patients' expectations and interests should be kept in consideration in modern oncology practices and should be expressed in the form of offering a tolerable, individualized therapy coupled with supportive care including CM under the umbrella of the standardized oncology protocols . Unfortunately the data about CM and its improper handling is a challenge; herbal products being one of the CM could interact with the drugs exploiting a source of health risk. They are also subject to adulteration, contamination or substitution with some other toxic products . In Egypt, studies regarding the perceptions and attitudes of cancer patients toward conventional and CAM therapy usage, types are scarce if any. This study aimed at assessing the pattern of use, motives and possible predictors of using complementary and alternative therapy among a sample of Egyptian oncology patients. This cross-sectional study was conducted at Kasr Al Ainy University Hospital (Oncology Unit), Cairo, Egypt, during the period from July 1st 2014 to March 31st 2015. This unit is located in a tertiary care level hospital, serving all cancer patients on chemotherapy and or radiotherapy. The outpatients unit is working 4 days/week and receiving about 25 to 30 patients per day (including old and new cases). The average number of patients seen at the outpatient clinic/year is about 3000 patient, an inpatient section (about 50 beds) for those needing admission in their early treatment phase or in response to the development of treatment-related complications. This Oncology unit is serving patients from all Egyptian governorates and regions. All cancer patients (irrespective of the cancer sites) receiving care at Kasr Al Ainy Oncology unit during the period of study were the targeted population. Sample size: Considering the total patients load at the Oncology Unit of 3000/year with hypothesized frequency of using of CAM among cancer patients (p) of 28% (± 5% precision), the total sample size required was 281 using the following formula under 95% confidence and 80% power: Sample size n=[DEFF*Np(1-p)]/ [(d2/Z21-α/2*(N-1)+p*(1-p)] using OpenEpi, Version 3, open source calculator-SSPropor (http://www.openepi.com/SampleSize) where p=proportion with the characteristics (outcome), z=1.96. Adding a 10% increment to compensate for the possible non-response, the total sample size was 337 cancer patients receiving care at the unit. Patients were selected using a systematic random sampling method where every 5th patient attending the outpatients unit was approached and personally invited. Selection criteria: Inclusion criteria: Both genders aged ≥ 18 years old, aware of their cancer diagnosis, fit enough to complete the interview according to recommendation of the treating physicians and free of any cognitive dysfunction. Exclusion criteria: incident diagnosis and those hospitalized in palliative care units. Reviewing of the patients medical records: To collect clinical information about the type and site of cancer, stage of the disease and type of treatment received. The duration of the condition and the previous history of surgical operations or intervention were collected. This tool allowed matching of the patients responses during the interview. Personal socio-demographics included age in years, gender, residence, religion and to what extent patients were practicing their religions. The cancer data: including site and type of cancer, duration since diagnosis, and the current treatment received. Problems encountered during treatment; their nature and the patients perceived value of the prescribed conventional therapy. Satisfaction with the current cancer therapy (very satisfied, satisfied, dissatisfied and very dissatisfied). Receiving of complementary and alternative cancer therapy: Options for the available CAM in Egypt were stated and the patients were required to mention those used with open ended question to include others. Whether used CAM before or after receiving cancer therapy, reasons for using the CAM (list of options were provided with an open ended option), frequency of use, duration and monthly cost of using CAM were also inquired. Their sources of information about the CAM, perceived benefits, the occurrence of side-effects whether they are going to use CAM in the future. Their beliefs about the use of CAM in cancer therapy, whether inform their treating physicians about using CAM. Pilot testing was carried out on 28 cancer patients (beyond the calculated sample size) with the following objectives: The comprehensibility of the items involved in the interview and adjusting the language and terms to suit the culture. Forms were checked during the collection phase to assure completeness; those with missing of more than two items were not included (n=8) or with inaccessible medical records (n=4). Data entry and analysis was carried out using SPSS version 21.0 (IBM, U.S.A). Categorical data were reported in frequency, proportion and percentage, univariate analysis with reporting of Odds ratio and 95% confidence intervals, Chi-square, Fisher exact tests of significance were used for comparisons. Continuous data were expressed using mean and standard deviation and student’s t test of significance was used for comparisons. P-value <0.05 was considered as significant. Logistic regression model was used to determine the possible independent variables for using CAM by cancer patients, those variables with statistical significance at the univariate level were included in the final model. While orienting patients about the research, their right of not to participate was emphasized. Those agreed to participate were included and a written consent forms were obtained. Permissions from the head of the oncology unit, hospital administration, vice dean of students’ affairs and college dean were obtained following the submission of the research proposal and the consent form. Confidentiality of patients’ records and information were maintained all through the study. A total of 331 cancer patients were included, aged 47.2 ± 16.5 years (median of 50.0) yeas. More than half of them were 50 or more years, 20% were <30 years of age, males represented 40.2%, over 35.6% with monthly income of <1000 Egyptian pounds and 38.1% were illiterate (Table 1). Table 1 Socio-demographic and cancer characteristics of the included patients in relation to their use of complementary therapy (n=331). Age in yearsmedian (mean± SD) 50.0(47.2±16.4) 45.0(44.5±16.7) 52.0(47.9±16.4) 0.140! Of the included patients more than 90% described themselves as religious and very religious, 45.6% were being at the early stage of cancer as revealed from their medical records. Out of the included cancer patients, 76 (23%) were on Complementary cancer therapy (CM) and none of them mentioned any alternative cancer therapy. The distribution of the socio-demographic and clinical data in relation to the use of CM revealed that female gender was significantly associated with the use of CM (Odds ratio, OR=1.78, C.I=1.10-3.10, P=0.018), those with secondary or less education status (OR=2.90, C.I.=1.20-7.10, P=0.011), those with low monthly income of <1000 pounds (OR=4.69, C.I=2.73-8.10, P=0.001) and those described themselves as not very religious (OR=5.18, C.I=1.74-15.48, P=0.013) were the significant sociodemographic factors positively associated with the use of CM among the included patients. Those with college education (OR=0.41, C.I=0.20-0.84, P=0.006, on sick leaves (OR=0.30, C.I=0.10-0.96, P=0.023), and at the early cancer stage (OR=0.44, C.I=0.26-0.76, P=0.001) showed negative significant association with the use of CM (Table 1). The most commonly encountered cancers included breast (16.9%) followed by lymphoma and leukemia (15.1%), brain tumors (9.4%), colo-rectal 8.8%, lung (6.9%), gynecological (6.6%), bone (6.0%) and head and neck (5.4%). Other sites represented less than 25% all cancers encountered. Of the included patients, 64.9% were satisfied and very satisfied with their current cancer therapy, more than one third (35.1%) expressed their dissatisfaction to the current conventional cancer therapy. Almost (40%) mentioned treatment problems in the form of financial, infrequent counseling by their treating physician, accompanied complications particularly with chemotherapy, current therapy is ineffective in improving their health status and psychological problems following the diagnosis. Of all cancers included only colo-rectal cancers showed significant use of CM (OR=4.23, C.I=1.93-9.24, P=0.001), satisfaction with treatment was negatively associated with CM therapy, while dissatisfaction was a significant positive predictor (OR=2.10, C.I=1.24-3.60, P=0.006). The presence of financial problems was a significant variable positively associated with CM use among patients (OR=4.02, C.I=1.25-12.9, Fisher exact P=0.025) (Table 2). Table 2 Cancer sites, satisfaction with conventional cancer therapy and treatment problems in relation to the use of cancer CAM therapy (N=331). Figure 1 demonstrates the reasons for using CM therapy by the included patients. The reported reasons included; CM increase body's ability to fight cancer in 24/76 (31.6%) please check the data set in the graph, followed by CM can improve physical wellbeing 13/76 (17.1%) and emotional wellbeing 11/76 (14.5%) CM is directly fighting cancer is stated by 11/76 (14.5%), no perceived benefit from the standard treatment 5.2%, CM is made of natural products with no harm (5.2%), and pressure from friends and family is another reason to try the CM by (3.9%) of patients. 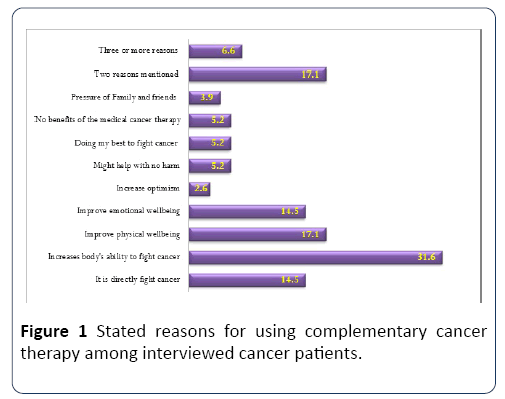 Figure 1: Stated reasons for using complementary cancer therapy among interviewed cancer patients. Table 3 displays the types, cancer sites, frequency, monthly cost, perceived side effects, perceived benefits and the reasons to continue CM therapy as stated by patients. Honey and herbal medicine were the most commonly CM used by a wide variety of cancers patients. Prayer and Rakia (spiritual sonna using Quran) were used by 17% of cases especially in cases with brain tumors, lymphoma and leukemia, 22.4% of patients used two or more of CM. Table 3 Types, pattern of use and motives for using of CM among the included patients. The majority of patients on CM started after being diagnosed and on standard cancer treatment (69.7%) and 68.4% used CM on daily basis. The median cost of CM was 250 (Interquartile range of 60-500) Egyptian Pounds/month, cost of CM showed wide variation from 100 to 5000 Egyptian pounds /month. Of those used CM, 18/76 (23.7%) mentioned the experience of side effects in the form of vomiting (6 patients), diarrhea (5 patients), abdominal cramps (4 patients), headache and dizziness (6), and combination of the fore mentioned side effects (9 patients). Of the interviewed patients 25% perceived no benefit of using CM, 39.5% stated improvement in their general conditions, 17.1% expressed a moderate improvement of their health following using CM, 18.4% were uncertain of the CM benefit. Of the currently 76 patients using CM, 49 (64.5%) expressed their intentions of future use of CM, as it can provide them with power (16.3%), CM is natural with no side effects (6/49 each), improve general health (5/49) and by using CM I am doing my best to fight cancer, increase immunity, CM is a sonna of prophet Mohammed (3/49 for each). Patients' beliefs toward using CM in cancer treatment; 4/76 (5.2%) mentioned that CM should be used alone, 44/76 (57.9%) with the standard cancer treatment, 18/76 (23.7%) and CM should never be used. 28/76 (36.8%) of the patients stated that their treating physician should know about CM (because he/she asked 4/28), for the sake of treatment (14/28), for his/her opinion (9/28). Of the included patients 48 patients didn’t inform the treating physicians abut CM because; they didn’t ask (29/48), not necessary for him/her to know (8/48), and the physicians would disapprove such therapy (11/48). Binary logistic regression model used to determine the possible predictors for using CM among the included patients. Table 4 showed that, being female (OR=1.68, C.I=1.112.56) and with dissatisfaction to the conventional cancer treatment (OR=1.65, C.I=1.01-2.67) were significant positive predictors for using CM among the sampled cancer patients, on the other hand early stage of cancer was a significant negative predictor for using CM (OR=1.65, C.I=1.01-2.67). Table 4 Logistic Regression Model of independent predictors of using CM Therapy among the included Cancer Patients. C.I=Confidence Intervals, Percent predicted for the model=97.0, Hosmer-Lemeshow Chi-square =18.501, P=0.035. The current study shows that 23% of the studied cancer patients received Complementary Medicine (CM), this figure is remarkably lower compared to previously reported figures from other countries like Korea (78.5%), Scotland (55%) and Switzerland (53%) . On the other hand, similar finding was reported in Saudi Arabia, where 21.6% of the patients reported receiving CM . The noted difference in the results could be attributed to the lack of standardized definitions and methods used to assess CM usage. Scarcity of previous studies conducted in Egypt on prevalence of CAM hinders comparing and tracing the trend of CM use. Honey and herbal therapies were the most commonly CM used among the interviewed cancer patients 42.1% and 18.4% respectively. Similar findings were reported in some other Middle Eastern countries as Iran, Jordan, and Turkey . El- Nimr et al. reported that herbal medications are the most commonly (CM) used among adult Egyptians by (91.6%), similarly, the herbal therapy use was favored by 90.2% of the patients . These findings are inconsistent with another study reported from countries like USA who commonly used dietary supplements , similarly the most preferred CM methods were vitamins/minerals and food supplements (42.3%) . In this study 23.7% of CM users mentioned the occurrence of side effect these findings are higher than those mentioned in a study conducted in USA which included thoracic malignancies patients , the difference in the results might be due to the difference in the subjects' inclusion criteria as well as the sample size. It could also be related to the lack of knowledge about the safety of medicinal plants in the Arab countries where CM practitioners have limited training. Consequently, there is an intense lack of pharmaceutical quality control in herbal preparation procedures. This study showed that (64.5%) of the included patients preferred to continue using CM in the future as they believed in its healing effect. Few patients only considered CM therapy to be used alone. Similar reported results supporting the patient’s willingness to integrate CAM into their oncological therapy to be offered as a concomitant therapy . Females had higher tendency to use CM in the current study (P=0.018). This is consistent with other studies results include in in USA and in Japan who found women more significantly open to CM than men [14,15]. These don't match with Paul et al. results . In the current study, low educational level, income, and selfdescribed as not very religious are significantly associated with higher use of CM. These findings were consistent with other studies carried out in Iran and Turkey. Meanwhile, our results were inconsistent with those reported in other countries like Ireland and Saudi Arabia where CM use was more frequent among highly educated and higher-income cancer patients . In Egypt, CM use was higher among educated males with chronic renal disease . Furthermore, some other studies have shown that the use of CM is associated with higher education and or high socioeconomic status [7,14]. Motives for CM use among cancer patients in the present study revealed that dissatisfaction with conventional therapy was the reason (OR=2.10, P=0.006). Those who expressed their dissatisfaction attributed that to financial problems, deficient communication and counseling by health care providers, and post treatment complications . CM users in our study believed it increases body’s ability to fight cancer and improves physical and emotional wellbeing which is consistent with results reported by Khalil et al. . Similar results were noticed in studies that were conducted in some other nations . Another study conducted among adult Egyptians reported that more than half of the participants used CM to avoid the side effects of modern drugs . The current study reported the median cost of using CM was 250 Egyptian pounds per month which is equivalent to 30$ at the time of data collection, the same expenditure was reported in Turkey with an average of 30$ per patient per month, they were also found to use the same types of CM therapies used as in Egypt . Shedding the light on patient-physician relationship, only 36.8% of the studied CM users had informed their treating physicians about their CM. A larger proportion of the CM users (48/76) didn’t inform their treating physicians about CAM. (29/48) stated they didn't inform their treating physicians because the physicians didn’t ask them about it, (11/48) responded that the physician would disapprove it, that is consistent with findings in other studies conducted in Ireland and Asia . Similar findings were mentioned by Osman et al. . This draws the attention to the importance of improving patient-physician relationship, history taking, proper counseling and confidence building skills on complying with the advice of health-care provider. About 40% of the studied CM users expressed their intentions to continue using CM in the future. They acknowledged an improvement in their health and believed in the importance of its combination with the conventional treatment. The previous results were lower than those reported from Ireland where 66.5% of CM users had expressed their intentions of future CM usage . In Saudi Arabia, more than 90% of the included patients used CM despite receiving cancer treatment in one of the most advanced facility . In many developing countries, ignoring the patients growing demands for CM therapies as well as the lack of holistic approach provision push the chronic patients to seek healing outside the modern healthcare facilities. Hiding the fact of using CM from the treating physicians exerts a possible potential of drug interaction, many chronic patients including cancer patients are looking for an alternative way to make up for their unmet needs. It is of utmost importance mentioning that evidence proved the interaction between chemotherapy or radiation and certain CM modalities that might counteract their efficacy explained as cancer treatment results in free radicals that is essential for treatment efficacy . Cancer patients should be offered proper guidance fulfilling their demand of conventional therapies and CM as a part of integrative health care. Oncologists have to be aware of that and exert more effort to overcome the communication barrier with their patients . The results of this study can be interpreted in the lights of the following limitations: first it was only single facility-based study, the pattern and motives of using CM can be different in relation to other settings treating cancer nationwide, second, the built in problem due to design used with the possibility of recall bias, and social desirability, and finally, problems with patients health records included incompleteness of data (cancer staging, presence of comorbidities, previous complications of cancer therapy and other relevant information) made the associations between these variables and using CM difficult to be ascertained. This study revealed that a significant proportion of Egyptian patients undergoing cancer therapy are using CM in response to their dissatisfaction with the conventional cancer therapy. Wang HH, Chung UL (2012) Use of complementary and alternative medicine among breast cancer survivors in Taiwan. APJCP 13: 4789-4792. Nissen N, Schunder-Tatzber S, Weidenhammer W, Johannessen H (2012) What attitudes and needs do citizens in europe have in relation to complementary and alternative medicine? Forsch Komplementmed 19: 9-17. Naja F, Alameddine M, Itani L, Shoaib H, Hariri D, et al. (2015) The use of complementary and alternative medicine among lebanese adults: results from a national survey. Evidence-based Complementary Alternative Med 3: 20-23. Fox P, Butler M, Coughlan B, Murray M, Boland N, et al. (2013) Using a mixed methods research design to investigate complementary alternative medicine use among women with breast cancer in Ireland. European J Oncology Nursing 17: 490-497. Robotin M, Holliday C, Bensoussan A(2012) Defining research priorities in complementary medicine in oncology. Complementary Therapies Med 20: 345-352. Kessel K , Lettner S, Kessel C, Henning B, Tilo B, et al. (2016) Use of complementary and alternative medicine as part of the oncological treatment: Survey about patients’ attitude towards CAM in a University-Based Oncology Center in Germany. PLoSOne 11:e0165801. Mao J, Palmer S, Desai K,Susan Q , Katrina A, et al. (2012) Development and validation of an instrument for measuring attitudes and beliefs about complementary and alternative medicine use among cancer patients. Evidence-Based Complementary and Alternative Mede CAM: 798098. Magi T, Kuehni C, Torchetti L,Wengenroth L, Lüer S, et al. (2015) Use of complementary and alternative medicine in children with cancer: a study azert a Swiss University Hospital. PLOS One 10: e0145787. Nazik E,Nazik H, Api M, Kale A, Aksu M(2012) Complementary and alternative medicine use by gynecologic oncology patients in Turkey. APJCP 13: 21-25. Abdallah R, Xiong Y, Lancaster JM, Judson PL (2015) Complementary and alternative medicine use in women with gynecologic malignancy presenting for care at a comprehensive cancer center. Int J Gynecological Cancer 25: 1724-1730. Shumer G, Warber S, Motohara S,Yajima A,Plegue M,et al. (2014) Complementary and alternative medicine use by visitors to rural Japanese family medicine clinics: results from the international complementary and alternative medicine survey. BMC Complement Altern Med 14: 360-366. Paul M, Davey B, Senf B, Stoll C, Münstedt K, et al. (2013) Patients with advanced cancer and their usage of complementary and alternative medicine. J Cancer Res Clin Oncol 139: 1515-1522. Ibrahim Y, Mustafa O, Tayfur T, Hande T, Fatma S, et al. (2013) Patterns of complementary and alternative medicine use among Turkish cancer patients. J of Palliative Med 16: 383-390. Chang K, Brodie R, Choong M, Sweeney K, Kerin M(2011) Complementary and alternative medicine use in oncology: a questionnaire survey of patients and health care professionals. BMC Cancer 11: 1-6. Jazieh A,Al Sudairy R, Abulkhair O, Alaskar A, Al Safi F, et al. (2012) Use of complementary and alternative medicine by patients with cancer in Saudi Arabia. J Altern Complement Med 18: 1045-1049. Nakayama A, Alladin KP, Igbokwe O, White JD (2011) Systematic Review: Generating Evidence-Based. J Cancer Invest 10:655-667. Cramer H, Lauche R, LanghorstJ, Paul A(2013) Predictors of yoga use among internal medicine patients. J Int Soc Complement Med Res13:172-177.